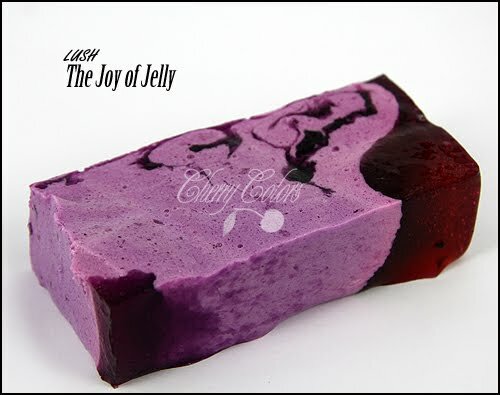 Review: Lush The Joy of Jelly - Cherry Colors - Cosmetics Heaven! I bought this product back in January (at the start of it, because I was very very obsessed with Lush then). I paid about 6€ for 150g, which is a great price considering that it will last you for a while. I have normal skin on my body, and on it, worked really nicely. It was fine for my dry hands too, but I found it to be too problematic for washing my hands. It has a very strong scent that is mostly flowery fresh I would say. It associates me with the scent of a cow and I have no idea why. After all, it is not a bad scent, but for me, it is a bit too strong. Mine came in a plastic container, but I know that there are at least 3 more containers for shower jellies. The jelly is well. a jelly and I thought it would be so much fun taking a shower with it. And you know what? It wasn't. I think it looks really pretty, I mean it's purple with some reddish parts and it's shaky! Wow! I like it, even if after some time in the container it starts to melt. Or it just gets wet, I have no idea. But it probably starts melting, because I let it air dry after a shower. I used it in three different ways. Alone, in a cloth and with a shower sponge. Alone: I cut it in a smaller piece and used it alone. In two months there was absolutely no change in the size or shape. I was kinda frustrated, because even if it washed me nicely I hated that it didn't get used up. At all. Well that's because I have about 6 soaps waiting for me to use them up.. yes. In the shower it was pretty fun at first, I mean it shakes and stuff... but after it felt on the floor for the 3rd time, it wasn't all that fun anymore! And it didn't leather at all, but it left me smelling good. In a cloth: This was my favorite type of use. I took a cloth napkin and put half of the piece you see on the picture in it. Then I tied it with an elastic. This time it lathered like mad (compared to before!!) and before I got to my tummy the jelly was GONE!! It left my skin moisturized and soft and smelling good. After I used it up, I left the cloth air dry. Shower sponge: Well first I must say that I do not like shower sponges at all. I mean I do not understand people who leave it under the shower so they could rot. I mean they would leave them there to air dry but they wouldn't consider that other people are using the shower too.. so all the bacteria accumulates on it and so on.. Anyway I don't like them. But I had to try. I took a small piece and rubbed it in a wet lufa, I even tried to stuck it inside of the lufa. And believe me when I say that this time there was so much foam that.. WOW!! Now that's a lot of stuff for the $$!! + If used with a lufa/alone you get a lot of stuff for the price. + The scent lasts for a couple of hours on the skin. + It comes in a handy plastic package. + It is fun - Jelly! + It's not tested on animals & it's vegan. + It looks really pretty. + If used with a shower sponge it leathers like hell! - It will melt if you leave it under the shower. - The scent may be too strong for some people. - It may be a bit too complicated to use. - If used with a cloth, it won't last you for a long time. Overall: I am pretty happy that I tried this product. It was kind of fun, tho not always. It looks great, it smells good but next time I'm going to try another scent. It didn't leave my skin squeaky clean and it left it nicely moisturized and smooth. I prefer using it with a cloth, so I get a lot out of it, but less than if I used a shower sponge... But I just prefer a cloth to a lufa.. I think it's a great product, but I wish it didn't contain any SLS and that it would have a more gentle scent. I don't think I would repurchase it, but I will try another scent. If you think you can handle a jelly under the shower, then go for it ;)!